So resently my computer has been running a little slower than usual. Not the main problem but might be useful. The main issue is that when turning on my pc, after a few seconds it just instantly restarts, as in turns off without warning then turns back on. Once it has done this once it just continues on and off about every second or so. My view is it much be power or motherboard related but that's just speculation. If specs are needed I can supply and could supply video of this happening if that might help. All parts are relatively new 1-2~ years. Any advice would be great thanks! Specs and make and model of PSU? Any thoughts on what it could be? I'm trying to find a spare motherboard that I can test with to check if that may be the problem. Most likely either heat or power problem. I would like to know which psu is used. Also try and listen to detect if the coolers pump works. What you can do is for testing is take out the gpu. 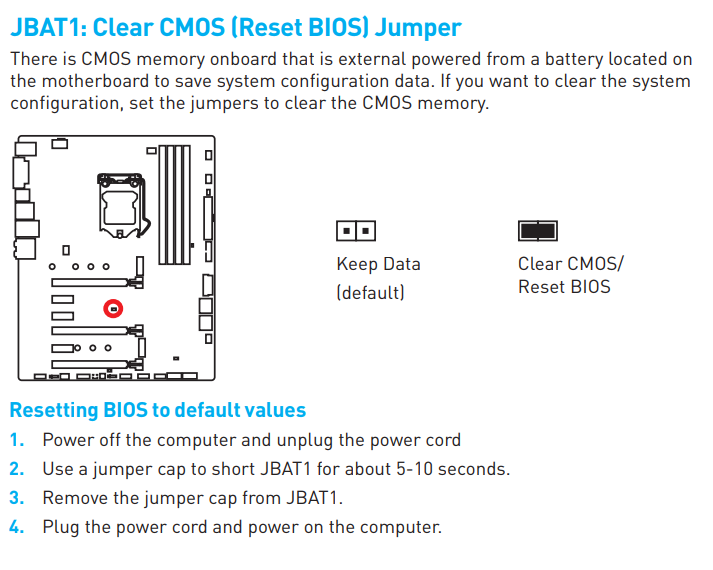 Also do a clear cmos,eitehr by using the dedicated jumper or take out the motherboard battery for <5min and push the power button to the case for about 30sec within that 5min timespan. For the clear cmos do you need to disconnect the power from the wall.Then use the motherboard output for video,the cpu has an integrated gpu. Test,see what this gives. is next to the motherboard battery. At first I did think that the cpu may be over heating but I've cleaned and replaced the cpu with new thermal paste and problem still persists. I'll try what you said and get back with the results. Thanks I appreciate the help with this. Back on the PC after trying what you said. I haven't checked the PSU as the problem seems to be fixed. After finding time to test here is what happened for the record. I think the pump was working fine. Removed the GPU, booted but still crashed. Ran setup bios loaded, things look fine and no crash for ~5 mins. Rebooted, windows loaded with automatic repair. Said couldn't be repaired and was logged (to F drive but I don't have an F drive??). Exited and continued to windows. PC rebooted to windows. Logged in and no sign of crash. Shut down and reinstalled GPU with display connected to GPU, booted to windows fine with everything looking OK.
Was there a reason as to why the CMOS was the problem? I haven't changed anything on the BIOS or anything that I know of. But thank you for taking the time to look at my problem. I really appreciate the help. It seems the problem isn't fixed, after working all yesterday night and this morning until later on in the day it suddenly shut down again, no warnings, just like someone pulled the plug and it continued back to doing what it was before. Edit: Also in regards to the PSU it is a Corsair cx750m. Also updated part picker list. So I've tried some other things to see what happens. First I removed the Gpu again and reset the Bios, pc booted to windows with no sign of crashing. As of now I have moved the Gpu to a different motherboard socket and so far it's not crashing. When I was removing the GPU I did notice that it was sagging on one side quite a bit in its original slot, so now I'm wondering if that's a part of the problem? Idk. Would there be any logs or anything that would give more insight to this? I'll keep this thread updated as I go. Hopefully this will be the last of the problem. PC just shut down and went back into the restarting loop again, I'm going to take out the GPU and leave it running, see what happens. Still crashing, with no gpu and reset bios. Can you test with another psu? I might be able to acquire a spare to test with yes. I'm guessing if that's not the problem them it's something with the motherboard? That might be it then,but in worst case might be cpu. You are running an older model CX series power supply , not very good in terms of quality and reliability. I think it's a power issue.